Gaps and bagging are signs of an improper fit. Cross the drawstring to pull taut around foot, then tie and tuck into the shoe. No bows or long drawstrings, please! Lower School Ballet Students in Intro to Ballet or Beginning Ballet: Bloch girls chiffon wrap skirt in black (CR5110). Upper School Ballet Students in Ballet Level I-V, Wearmoi "Alegro" wrap skirt to match class leotard color. Leotard: Bloch short sleeved leotard (CL5402) in black Skirt: Bloch girls chiffon wrap skirt (CR5110) in black Tights: Bloch footed tights (Endura Elite TO981G) in “pink” Shoes: Pink leather full-sole ballet shoes Hair: Ballet bun required. Top: Black shirt Bottom: Black loose-fitting pants Shoes: Black lace-up hip-hop sneakers or tennis shoes (only to be worn in class so dirt is not tracked into the dance rooms. In addition to the dress code below, other leggings or dance pants over tights are optional and allowed upon the teacher’s discretion. If pants are too long (dragging the ground) this could be a potential safety hazard and will not be allowed. Hair must be securely pulled away from the face for ALL CLASSES. For Creative Movement, and lyrical classes, ballet buns are preferred but ponytails are acceptable. For all other ballet classes, ballet buns are required. For tap, jazz, hip-hop, and contemporary classes, ponytails or ballet buns are acceptable. If hair is too short to make a bun, please pull hair away from face into a ponytail and secure with clips and hair spray. Dancers will need the following supplies with them in their dance bag (for all ages): Brush and comb, nylon hair net, braided elastic band, barrettes/clips, hair pins and bobby pins, hair spray. Brush hair smooth. Remove all tangles. Spray hair lightly with hair spray. Smooth hair with hands and secure wisps, layers or short ends into ponytail and secure with a braided elastic band (do not use rubber bands – they tear hair). Secure sides and back of hair with clips or barrettes. 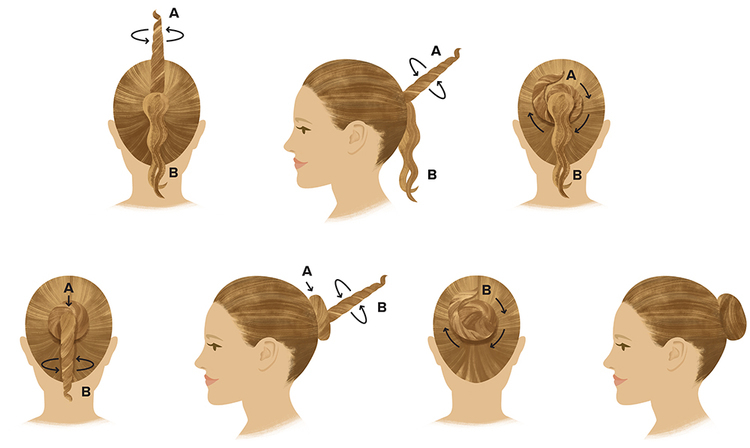 Divide ponytail into two sections and twist-or-divide ponytail into three sections and braid. Wrap each section of twisted or braided hair clockwise around the braided elastic band. Secure with hair pins and bobby pins as you wrap. Place the net over the bun; twist the net over the bun at least two times. Tuck ends of hair net into the bottom of the bun and secure with hair or bobby pins. Spray hair and bun with hair spray to set. Smooth with hand or comb. WHY DO DANCERS WEAR THEIR HAIR THIS WAY? Credible professional dance schools require their students to wear their hair up for class. The correct use and placement of the head and neck are very important in dance for concentration and balance. Hair must be pulled back in this way to allow instructors to see the development, technique and growth of the head, neck and shoulders so that they can give proper corrections. Unsecured hair is distracting and can throw a dancer off balance, especially when turning. Bangs and wisps can inhibit the dancer’s line of sight. A uniformed look is desired in class and is essential for neat grooming, confidence and conscientiousness. This also demonstrates the value of being prepared and focuses the student’s expression into their dancing.